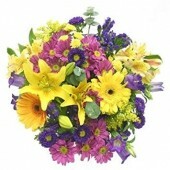 Mixed Flower bouquet can use for many occasions such as birthday, anniversary, wedding, concerts or any other occasions. 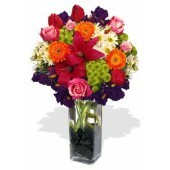 Our flower shop use the main flowers of roses, lilies, gerberas and carnation etc. mixed with seasonal matching flowers. Normally can be kept between 5 to 7 days at the room temperature. If you want the flowers to be last more longer, please remember replace the water of the vase everyday and add a little fresh flower preservative, so the roses can be more brilliant and lasting. Three Pink Gerbera, Four Red Roses, Fillers and Leaves with Pure White Lily Beautifully arrange in a..
Mixed Bouquet ,2 Gerbera and 3 Rose..
Mixed Bouquet , 4 Gerbera and 1 Lily..
Baby Breath Bouquet, A very special Korea Style Bouquet, good for birthday, anniversary, celebration..
6 Roses and 4 Asiatic Lily Bouquet ..